For the last five years, you have been in sublime form with the bat. The way you have amassed runs against quality bowlers across different conditions while breaking several batting records along the way has made us gape at you in awe. Having already notched up 41 centuries in ODI cricket in such a short span of time, the world truly knows that you look all set to take ODI cricket to statistically new peaks that have been never witnessed before. But when I personally think of you and your most priceless moment, my mind goes back to 2011. Yes, I am talking about the World Cup final. You played an important knock in the final against Sri Lanka and fulfilled India's dream of winning the World Cup again. But, the event that unfolded during the victory lap, is worth reminiscing time and again. You carried the legendary Sachin Tendulkar on your shoulders and said with great zeal that he had carried the burden of the nation for two decades, and it was now time for us to carry him on our shoulders. Right from the moment you offered your obeisance to Sachin, we could notice a lot of change in you. You were no longer the young bubbly Virat Kohli. Instead, we could see the spark in your eyes which is filled with complete focus. Your strong muscular arms are always pining to score runs at will. Above all, I could see the hunger and the passion with which you were about to go about your business. On the flip side, there also a lot of people who criticize you for your aggression and for giving vent to your feelings. I feel when you pour out your emotions, it brings out the best in you. So I believe you do not pay heed to those comments and trolls. Right now, I know that you would be gunning to win the IPL trophy for RCB. But do not forget to take your eyes away from the World Cup for it is the ultimate prize one could crave for. Just like how Sachin was lifted by the entire team eight summers back, it is now time to replicate the same moment but with a small change. The person to take centre stage now is Mahendra Singh Dhoni. I urge you to give a fitting farewell to him and bring back the smiles on Indian cricket fans. Until then, it is goodbye from an ardent well-wisher. 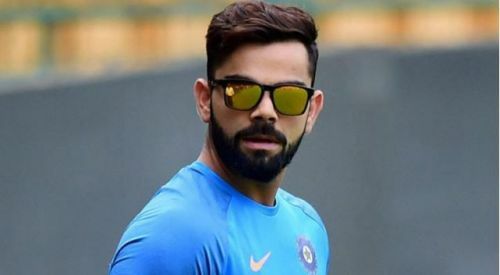 World Cup 2019: Will RCB's poor performance affect Kohli's captaincy?